One Eternal Day: "By ready exercise of courtesy and friendly good humor"
"By ready exercise of courtesy and friendly good humor"
In "Officer Friendly is Dead" someone experienced in law enforcement writes about what he views as a bad turn that policing has taken in recent decades. His thoughts are occasioned by the murder indictment of a Chicago police officer. The basic mission for which police exist is to prevent crime and disorder as an alternative to the repression of crime and disorder by military force and severity of legal punishment. The ability of the police to perform their duties is dependent upon public approval of police existence, actions, behavior and the ability of the police to secure and maintain public respect. The police must secure the willing cooperation of the public in voluntary observance of the law to be able to secure and maintain public respect. The degree of cooperation of the public that can be secured diminishes, proportionately, to the necessity for the use of physical force and compulsion in achieving police objectives. The police seek and preserve public favor, not by catering to public opinion, but by constantly demonstrating absolutely impartial service to the law, in complete independence of policy, and without regard to the justice or injustice of the substance of individual laws; by ready offering of individual service and friendship to all members of society without regard to their race or social standing, by ready exercise of courtesy and friendly good humor; and by ready offering of individual sacrifice in protecting and preserving life. The police should use physical force to the extent necessary to secure observance of the law or to restore order only when the exercise of persuasion, advice and warning is found to be insufficient to achieve police objectives; and police should use only the minimum degree of physical force which is necessary on any particular occasion for achieving a police objective. The police at all times should maintain a relationship with the public that gives reality to the historic tradition that the police are the public and the public are the police; the police are the only members of the public who are paid to give full-time attention to duties which are incumbent on every citizen in the intent of the community welfare. The police should always direct their actions toward their functions and never appear to usurp the powers of the judiciary by avenging individuals or the state, or authoritatively judging guilt or punishing the guilty. If the police want to make their jobs less dangerous, then they need to pay particular attention to Principle #2, because if they lose public respect—which I submit they are moving awfully close to losing—their job will become effectively impossible. 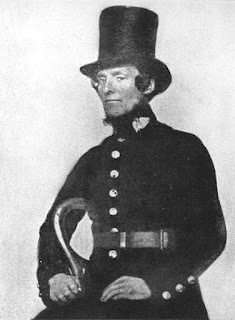 The members of the police force created by Sir Robert Peel were colloquially known as "Peelers" or "Bobbies" (the one that stuck) both, of course, deriving from his name. Their uniforms were designed to not look anything like military uniforms — the coat looked much like a frock coat with tails and copper buttons (thus "Cop" or "Copper").